This self-contained ground floor bed sit has a comfortable double clikclak sofa-bed, a kitchenette with kettle, hob, microwave, and fridge freezer, gas BBQ, plenty of storage space, and an en suite bathroom with walk in shower room. Linen, towels and toiletries are provided and there is free Wi-Fi. There is also a private sun terrace with table and chairs. 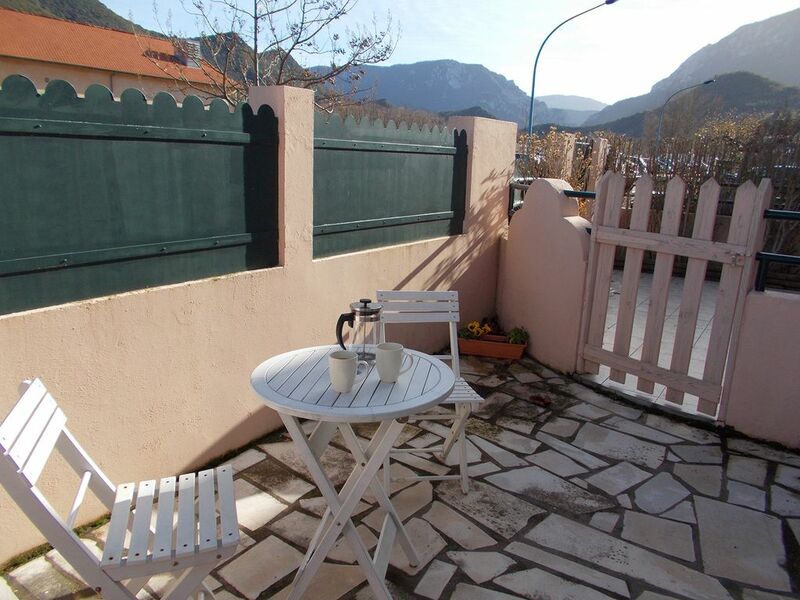 The bedsit is ideal for people looking for a relaxing vacation or planning an activity break in the south of France. It is situated in a quiet street near the centre of town, just a couple of minutes walk from all the amenities. The room is lovely in summer with a sun terrace, and shutters and a fan to keep cool. Quillan is a lovely town on the beautiful River Aude. Large bathroom with walk-in shower. A fridge with an icebox is provided. BBQ utensils are provided along with plates etc. Private sun terrace with table and chairs. The property was as pictured. It was just what I needed. David and Amy where extremely hospitable and pleasant. Always ready and willing to suggest things to do in the area. Gave me some history on Quillan which I found very interesting. I will definitely be staying there again some time soon. Very nice Bed Sit close to all the services, set on quiet street , very peaceful. The owners were very helpful. Quillan is a lovely town on the River Aude, surrounded by mountains. There is a wide range of activities on the river in summer, including rafting and kayaking. In summer Quillan also hosts a jazz weekend, guitar festival and folk music festival - and the Tour de France passes through the area in most years. If you want to explore the beautiful scenery and long historical heritage of the local area, Quillan is the perfect base: medieval castles at Puivert, Montségur, Puylaurens and Queribus are not far away. There are markets in Quillan twice a week, and attractive market towns like Espéraza and Mirepoix are within easy reach. Mediterranean beaches are 90 minutes’ drive from Quillan, and the nearest ski station is half an hour’s drive away. Just a couple of minutes' walk away are restaurants, bars, shops, cinema, and an open air swimming pool. There is easy access to nearby towns, with one-euro trains and buses to Carcassonne and Perpignan departing just 200m from the house. There are swimming lakes and hiking trails nearby. The Languedoc is one of the sunniest regions of France, with over 200 days of sunshine a year. Other nearby activities include wine tasting, horse trekking, gliding and microlighting, an outdoor activities centre, rock climbing, cave exploring, canyoning, biking (on and off road), archery, high ropes, even a boat journey down the longest underground navigable river in Europe at Labouiche. Whatever your interests and no matter how diverse your group, this area has an abundance on offer for everyone. Even more activities are available from the Tourist Information office, which is less than 200m away. The security deposit is refundable in full on departure, as long as there is no serious damage or excessive cleaning required.